This summer many families may be spending more vacation time at home instead of traveling to a distant location. According to the American Lighting Association (ALA), with a few updates to your outside lighting, you can enjoy a mini vacation at home. Believe it or not, it’s easier – and less expensive – than you might imagine to transform your existing patio, deck, or pool area into a retreat that you will love (and that will make the neighbors jealous). Rather than buying a costly designer patio set or lounge chairs that will lose their luster by next season, invest in a new lighting scheme that will enhance your existing outdoor furniture and amenities. “It’s an easy project that adds beauty, value and security, and doesn’t take a lot of time,” Wiedemer says. Lew Waltz of Hadco agrees. 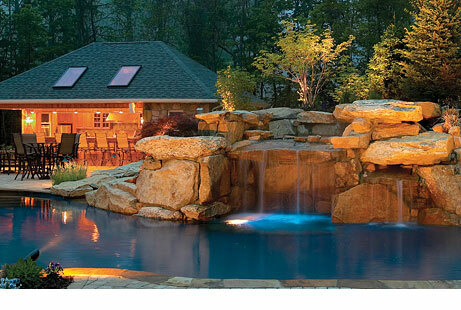 “The best thing about using low-voltage lighting outdoors is you don’t have to do everything at once,” he explains. “I recommend purchasing a transformer that is larger than you immediately need. Let’s say you want to illuminate the deck area and provide task lighting for cooking at the grill. 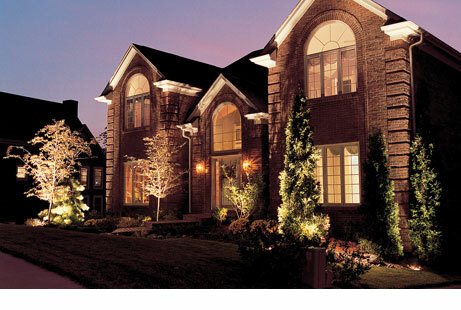 After selecting the fixtures, you add up the wattage and figure it will use 200 watts of light. However, next year, you might like to add lighting to the patio, highlight some potted plants, and install a water feature in the backyard,” says Waltz. “Instead of purchasing a transformer that is just large enough for the deck, buy one that will operate two to three times that amount of wattage. You only pay for the energy consumed by the fixtures. In other words, a 600-watt transformer that only has 200 watts of fixtures on it, uses 200 watts of energy, not 600,” he says. Another important tip is to buy the best quality and well-constructed fixtures you can afford. “They will last for decades,” Waltz says, adding, “There are a tremendous number of homeowners who purchase the least expensive fixtures they can find, only to discover that they need to replace them within a year or two. That actually ends up costing more over a 10-year period than if they had purchased better-quality products in the beginning,” he says. When laying out your project, remember a little light goes a long way outdoors. Consulting with a lighting professional at your local ALA-member lighting showroom can help you avoid making the common mistake of too many fixtures in one area. These days there are many more decorative landscape lighting fixtures than the basic black path lights. Wiedemer suggests taking inspiration from your home’s interior or exterior architectural elements. “The combination of form plus function is very important,” he says. “The idea of enhancing your outdoor environment to reflect your personal style is very popular, especially as we look for more ways to extend the amount of time we spend outside. There are many attractive designs available and you can add color and interest with different glass choices, unique castings, nature-inspired shapes, and architectural elements,” Wiedemer says. A new and extremely efficient light source – and what Wiedemer refers to as “a true ‘green’ solution” – is LED. This developing lighting technology provides equivalent light output to that of halogen or incandescent, but at considerable energy savings of up to 75 percent less. Wiedemer estimates the average lifespan of a well-made LED light source to exceed 40,000 hours or more than 12 years of average nightly use. If you install timers with the transformers to turn the system off during late night hours, you will not only cut down even further on energy costs, but will also increase the lifespan of the bulbs. Please visit your local Dominion Electric showroom to see a multitude of styles that will create focal points for your garden or yard while making a decorative statement.